If you are looking for a reliable and fast professional translation service to translate your Chinese driver’s licence into English in Australia – look no further! Our team of NAATI accredited professional Chinese translators are qualified to translate your Chinese driver’s licence into English. Our Chinese licence translation service is the most popular Chinese translation service in Australia, with prices starting at just AUD $69 per licence. How soon can will I receive the English translation of my Chinese licence? Can I use the English translation to rent a car in Australia? Yes you can. If you are on a temporary visa (eg. student visa, working holiday visa, tourist visa etc), then you can rent a car using our English translation of your Chinese driver’s licence. How do I order my Chinese driver’s licence translation? Follow 3 easy steps by following this link to order your Chinese to English driver’s licence translation today. It only takes 5 minutes to place your order and you can complete the order completely online. See what our happy Chinese clients are saying about us! I am very grateful for your helpful Chinese licence translation service. The English translation arrived today in the mail and I am very pleased. NAATI certified Chinese translation was very fast and friendly service. I am very happy. Please thank Carol for her fast Chinese to English translation of my Chinese licence. 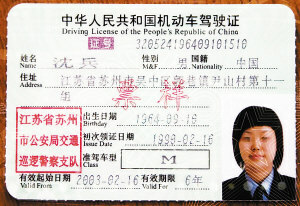 For translation of Chinese driver’s licences into English, our pricing starts at just $69.00 per licence. For further pricing information, please follow this link – pricing options are displayed on the final page with all options.